The Quicksilver Activ 605 Open is a built to please. It takes up to 7 people out for a full day of fun. The boat was designed with comfort, ergonomics and functionality in mind, turning the deck into the best possible place to spend some time off relaxing or fishing. A Mercury engine with up to 150 hp ensures safe navigation and a list of options adds even more to the fun on the water. 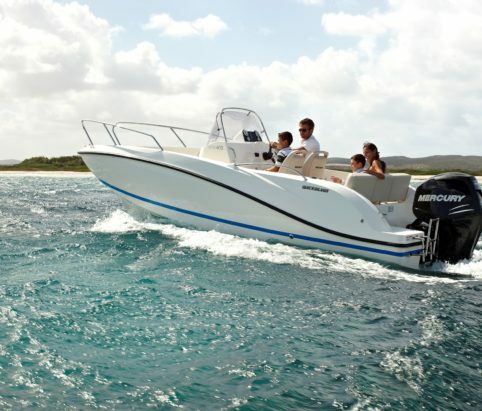 Safety on the boat is guaranteed by the high free board and the ease of circulation. Kids and seniors can walk about easily. But you probably prefer swimming to walking. A pivoting backrest provides smooth access to the large swim platforms. There, you’ll also find an integrated swim ladder. So it’s up to you. Dive in right away or stick to the gradual approach and go in step by step. The cockpit is packed with features. The pivoting backrest allows an easy and unobstructed access to the swim platforms. Also, the 2 swivel seats allow the pilot and the co-pilot to turn towards their passengers and join in on a group conversation. The optional cockpit shower lets you freshen up after a swim. For the driver, the boat’s bi-colour helm is equipped with integrated cup holders, a storage tray and a mounting space for a 7” GPS/Chart Plotter.